Fruity flavors are typically described as black cherry and current. The jewel in California's crown, known as the king of the reds this grape produces a complex dry red wine. One of the most popular grapes. This grape generates a red deep-colored, full bodied wine. Produces a somewhat dry and tannic (mouth dry sensation) wine that ages well and softens with time. This wine has high alcohol content and can exhibit a ripe, current flavor with a hint of smokiness. Naturally sweet, fruity and very low tannin. Grenache is used to produce Rose wines or red wines when blended. Distinctive, aromatic, spicy, medium red table wine is produced from this grape. An abundance of fruit and a velvet like quality. These grapes produce a deep colored robust and peppery wine that packs plenty of tannin and has a good aging ability. Goes well with big well seasoned meals. Low acid vine grown almost exclusively in the provinces of Cuneo and Alessandria in Piedmont, Northwest Italy. The wine produced is a gentle, fruity and fragrant wine with flavors of liquorices and almonds with deep red color and purple tones. Limited availability. Originally from France where it is used in all of the great red burgundies. This grape produces a wine that is clear, brilliant and medium to deep red in color. It is rich, velvety and full of flavors such as cherries, plums, raspberries and straw berries. A child of Cabernet Sauvignon and Carignane. The grape has a dry Cabernet like aroma, good acidity and fruity flavors. It is good for first time wine makers because it consistently makes a great red wine. The dominant grape in Chianti, it is usually blended with 20% white Malvasia in Italy. The California grape is lighter in color. The grape can be blended with Zinfandel or Cabernet. This wine also needs longer aging in the barrel. Clonal cousin of Petite Sirah makes a full bodied tannic wine. This grape is able bodied enough to be made straight or used as a blending component to strengthen any wine. Three styles of red wine are produced from this varietal grape depending on what region the grape comes from. A light spicy flavor with a berry like aroma. Oak aged. Intense, berry like, full bodied and dark in color, or a rose style White Zinfandel. 80% Cabernet and 20% Zinfandel. Over the past few years the Cabernet has not been dark in color but has been great in taste and body. The addition of Zinfandel will ensure good color and will add more flavor to the wine. 75% Cabernet and 25% Barbera. Barbera will add the needed color and soften this blend, while the Cabernet will supply the backbone and complexity. This is a great everyday table wine. 80% Merlot and 20% Cabernet. Will add some color to the Merlot. 80% Cabernet and 20% Merlot. Typical Bordeaux style blend. This famous French Rhone Valley blend includes the main varieties of Grenache, Cabernet Sauvignon, and Alicante. The choices are endless. A great blend of Nebbiolo, which is rich in color and Barbera, which is lighter and full in flavor. Petite Sirah can be added for more color. This is one of the finest wines in the Piedmont region of Italy. Grandpa blended these grapes and it has become a favorite through the years. A blend of 30% Alicante, 30% Petite Sirah, 30% Grenache and 10% Muscat. Assorted mixed blends. A favorite is Cabernet, Grenache, Barbera, and Alicante. Made from a blend of Sangiovese and Cabernet Sauvignon. 70% Barbera and 30%Petite Sirah. This blend produces a fruity, well balanced wine that is great in color. This is one of our favorites. 70% Zinfandel and 30% Barbera. This blend has all the qualities of a great Zinfandel with the added softness from the Barbera. 70% Sangiovese 20% Cabernet and 10% Black Malvasi. This blend has all the qualities of a classic chianti. Petite Sirah can be substituted for the Cabernet, but at least one is necessary to help add body and color to the California version of the Sangiovese. This premier California varietal grape yields a full bodied moderately acidic dry austere wine. Flavors can be described as buttery, creamy, nutty and smoky. Excellent with fruit and cheese. Produces a fresh, fruity, dry to sweet wine. Makes a well balanced wine with delicate floral characteristics with a hint of melon. Popular as a cocktail wine. Produces a wine with a bright color and a rich texture. Tasters often refer to peaches and apricots when describing this wine. Viognier, a hedonistic, aromatic wine should be consumed in its youth. Excellent Italian style clean crisp white wine. A classic German grape variety. Has the potential to make a wine with tremendous flavors. Light in body and low in alcohol yet intensely flavored with a zesty bouquet. A grape producing white table wines ranging from sweet to dry. When considered "dry" it is excellent with seafood or poultry. When considered "sweet" it is a great sipping wine when chilled. Sometimes the Fume name will appear before or after the Blanc, which brings a drier, grassy or smoky taste. Produces outstanding sweet dessert white wines. Forms the basis for Asti Spumante and other Italian sparkling wines. Persistent, perfume, musk and ripe grape characteristics. 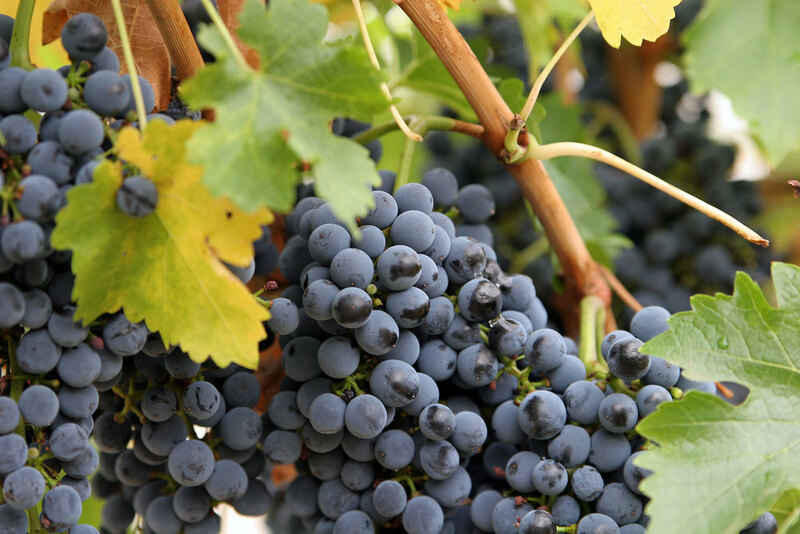 The ripe, lush black grape variety Malbec was once popular in Bordeaux as a blending component. It's still used for blending with Bordeaux varietal's worldwide and at times, in varietally labeled bottling's in the U.S., but now it's better known on its own. South America, where wine drinkers like potent reds, have made Malbec into a real regional specialty. Malbec's rich, inky color and fat, juicy personality make it brilliant with mellow, long-simmered dishes like braised red meats and stews. The deep legendary "black" wine of Cahors is traditionally matched to hearty rib-sticking dishes. Carmenere is a member of the Cabernet family of grapes originating in Medoc, Bordeaux. At optimal ripeness, the wine is fruity (cherries), crimson in color, full-bodied, with spicy, earthy notes. The after taste is particularly long; with Integrated tannins allow early consumption, although the wine ages well. On the nose there is a slight gamey aroma (sometimes referred to as beetroot) intermingled with ripe red fruits. The flavors are earthy and fruity and, on the finish, you may find the hint of a pleasant metallic flavor that I've encountered only in carmenere. Not available in Bordeaux but now enjoying a resurgence in Chile. Powerful fruit and spice flavor with mellow tannins for a velvet finish. Will develop quicker than the Cabernet and will stand up to similar food pairings. Just as big and bold in Chile as in other regions of the world! As the king of the red grape this produces a wine that is rich in color, intensely flavored, and tannic with hints of mint, blackberry, and black currant. Also known as "Shiraz" in Australia, this grape will produce a dark, rich, full-bodied wine with a chocolate aroma. Chile has come a long way in growing high quality grapes in this varietal. If you love Syrah, this is a great choice; the flavor characteristics in the "Chilean Version" are more bold and pronounced.